I cannot do it on my own dear mother. you have been interceding on my behalf. I bring my humble self back to you for blessings and divine mercy. Through your intercession, I ask the Lord Jesus Christ and to bless me with a good appointment where my service will be remarkable and make an impact in the lives of many refugees and other persons of concern. Bless my parents in heaven who loved each other and all their family. Help Trevor make the right decision. Bless all my family and friends. In the name of the father. Amen. Pray that Peter is happy in his new work as l do not feel l could listen with same patience. Help Gineen find her pathway in life. Help Geraldine find a job near home. Bless Keith, Cathy and all my family. Especially my grandchildren and Mavis and Trevor and their family. Blessed St Anne and St Joachim Help Peter in his new job to be happy and fulfilled. Give Gineen a job or a real purpose. Give Geraldine the hope of a new job. In the name of the father.Amen. I am currently not working right now. They cut my hours at Walgreens. I am hoping they will call me back in the fall to work when some kids go back to college. I will keep you posted on that. Thanks for the prayers!! I pray for release from my current perceived captivity into a new and better way of life and love. I also pray for the safety of my daughter and her child and fiance, and my niece Skye. 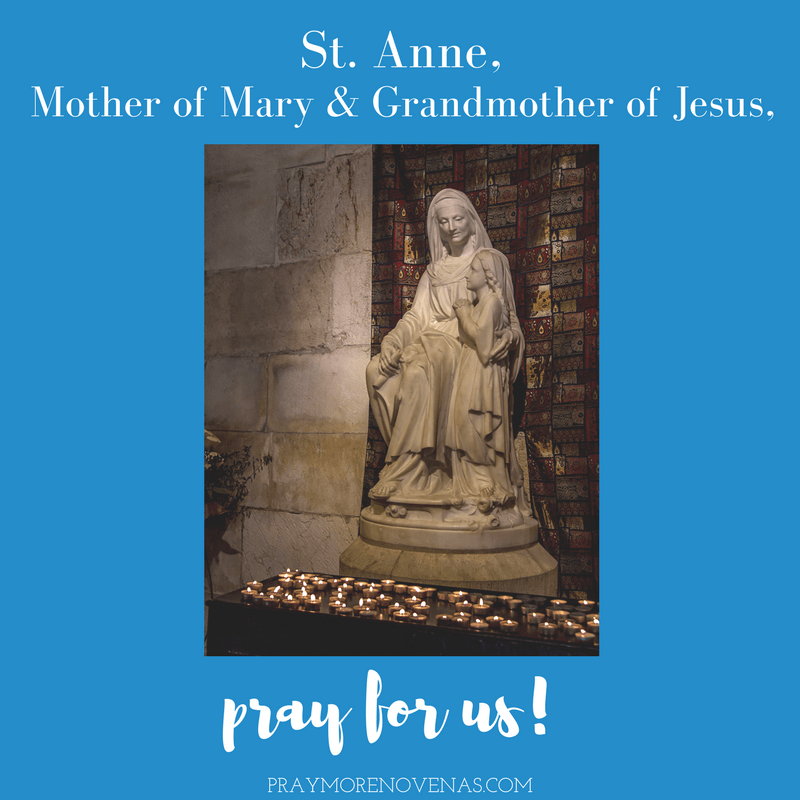 St. Anne please hear my prayers for my husband and sons! Please pray for my son who has two important interviews tomorrow. May the gifts he’s been blessed with shine through with your light & love. Most Holy and blessed ST Anne, please pray for Regina in her move to her new location successfully. Please pray for my God-daughter TC from a broken hesrt. She was crashed to learned after 3 years that her boyfriend wasn’t interested in marriage or the Catholic faith…Pray for TC to meet a good Catholic young man n who loves children. Dear St. Anne, please hear my prayer for my daughter to have strength and healing after her boyfriend of 20 months abruptly ended their relationship on May 29 and moved on to the girl he was cheating with the very next day. My daughter was totally blindsided and is still experiencing feelings of betrayal and hurt. Thank you for beautiful holiday at Coimbatore. Give Jean Sybil a safe journey to Mangalore and later Bangalore. I pray fir a job that my friend Bea is applying to. Just a thank for the sign Jesus already showed to me. Thank you Dears Saint Ann and Mary, Grandmother and Mother of our Savior Jesus, for your intercession! St. Anne please pray for me. I need employment as I will be losing my current job on Friday. I’m the sole money source in my household, and I have very little in my saving. I do have an interview today so, say I extra prayer I get that so I will be able to start working there as soon as possible. My prayer is for that my granddaughter to find a meaningful job with benefits,I pray for others that maybe seeking employment. I pray for myself that I will be able to return back to my old job or one similar. St. Anne pls pray for the healing of nanay that may she regain her strength and be able to walk again. May you also pray for yhe healing of mommy from her lung cancer, that she may not lose hope in her life. May you also strengthen us that me may have the patience and understanding in taking care of them as well as in our respective jobs that we may become good at it especially me being a lawyer. May you also pray for the safety of my whole family away from harms and dangers and evil temptations. AMEN. St annr i ask to help my daughter in finding a better job and. Find love. To pray for my son go seek a career. In the nacy. May he open his eue and mind to thos. Iask this in the name of jesus amen. pray for my son to stay focus and complete his undergrad degree and find a good and profitable profession. Pray for my daughter to get a permanent job with the Catholic School Board. For my son, that he continues to overcome his hurdles as he begins his senior year in college. For his girl friend, that she is able to find a good job and feel success. Also, that she and my son begin to know the true power of God in there lives. For my niece and her husband, that they will be able to successfully conceive and bare a healthy baby. In Gods time I found what made it necessary to continue His work on this earth. Thank you God. Please St. Anne help my nephews to get good jobs to support their families and that my children hold onto the jobs that they have. Thank you St. Anne. Thank you Jesus. Please pray for me that work will increase so I may better support my family. Please pray for my little daughter that she will be able to stay near her father. Amen. Dear St Anne please help me and blessed me to be the topnochers of nursing board examinations on November 17 and 18 with the average of 88%..Give me more wisdom and knowledge ..give me peace of mind while I’m preparing for my exam…Help me to fullfilled my dreams.. God bless..Amen..